There are only two kinds of people. There are those with the Holy Spirit in them, given because in God's grace, someone whom the Spirit had drawn to Jesus repented of their sins and confessed Jesus is Lord. All other people who have not confessed Jesus as Lord are operating under the lordship of satan, with the antichrist spirit in them. Satan said he wants to be like the Most High, usurp Him from His throne and sit there instead. (Isaiah 14:13-15). All people under satan living in their flesh want to do the same. The bottom image below is a scene from the Vatican in Rome, the Sistine Chapel. Michaelangelo depicted the "Creation of Man" in this now famous and iconic painting on the chapel's ceiling. The original painting is larger, the portion below is an excerpt. The top picture is from a CNBC article this week (which I flipped horizontally) touting that robots are now infiltrating the white collar realms and that jobs are at risk as a result. The photo-journalist could have set up the shot from any angle. He could have showed anything at the factory where he was taking pictures. In fact in other photos in the same article, they did. They shot the assembly line and the talking heads being interviewed. 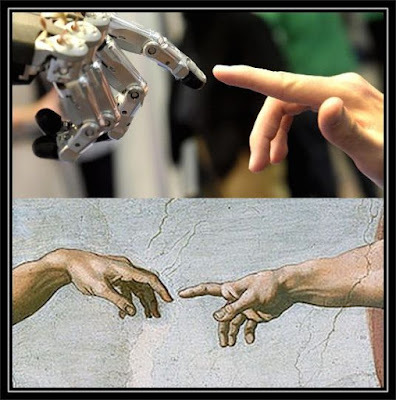 But someone thought it would be smart to mimic the creation of man in this photographic set-up. Man thinks of himself as a god because the sin nature in the unsaved person lets him. It even encourages him to believe so. It's what was at the root of Adam and Eve's rebellion. Satan had said 'you will be like God, knowing good and evil', and it was the same antichrist spirit that was at the root of the Tower of Babel incident. It's an internal attitude of rebellion expressing itself externally. It is a drive of wanting to live apart from God through personal ambition and personal pride- self. The saved Christian is not immune from the same attitude. We have the Holy Spirit in us but we still have the same flesh. We still have the same impulses that want to follow the world, engage in sin, and worst of all, usurp God from His place and put ourselves there instead. This is what Puritan John Owen wrote about in his mighty tome, The Mortification of Sin. Our task as believers is to crush the spirit that wants to put ourselves in God's place. The book is a "treatise by the puritan John Owen on the importance and work of the Christian in putting to death their deeds of the flesh." (Amazon synopsis). How do we crucify our flesh so that the tendency of the natural man won't quicken? To be sure, the antichirst spirit is NOT in us, because the Holy Spirit is. But our deeds still tend toward self and not in glorifying God, especially if we relax our vigilance. Well, first, here is a "Monster Cheat Sheet", notes that might help you as you make your way through Owen's dense discourse. The deeds of the body. The word is praxeis, which, indeed, denotes the outward actions chiefly, "the works of the flesh," as they are called, ta erga tes sarkos, Gal. v. 19; which are there said to be "manifest," and are enumerated. Now, though the outward deeds are here only expressed, you the inward and next causes are chiefly intended; the "axe is to be laid to the root of the tree," -- the deeds of the flesh are to be mortified in their causes, from whence they spring. The apostle calls them deeds, as that which every lust tends unto; though it do but conceive and prove abortive, it aims to bring forth a perfect sin. Unless you get to the root of it, your (my) sin will spring forth perfectly. So in looking at Luke 3:9, the axe laid to the root verse, it brought to mind that man lays his axe to the TRUNK of the tree, but God lays His axe to the ROOT. We need the Holy Spirit to get at the root of my sin. Mortify it, Spirit! Help me, a sinner to kill the sin that still dwells in me. Owen is admittedly a bit solid for quick consumption, so the 'cheat sheet' above is helpful in outlining the necessary duty of mortifying (killing) sin. Ligonier's synopsis is also helpful, here, How to Mortify Sin. MacArthur's Killing Sin helps too. The flesh always wants to usurp God from His place. It wants to think more of ourselves than we are. We are not Creator, we are creature. Praise goes to God for sending His Son. (Psalm 2:7). Praise goes to Jesus for becoming sin on our behalf, though never having sinned. (2 Corinthians 5:21). Praise to the Holy Spirit who dwells in us and helps us. 1. Resist the devil, and he will flee from you. (James 4:7). Keep resisting! This is the battle of the flesh. Don't take another bite! Don't walk toward that woman! Don't pour anther drink! Don't let your finger click that mouse to a bad website! 2. For we do not wrestle against flesh and blood, but against the rulers, against the authorities, against the cosmic powers over this present darkness, against the spiritual forces of evil in the heavenly places. (Ephesians 6:12). But ultimately it is a spiritual battle. Lay the axe to the root of it! 3. Likewise you also, reckon yourselves to be dead indeed to sin, but alive to God in Christ Jesus our Lord. (Romans 6:11). Therefore consider yourselves dead to sin. And so, submit yourselves to Christ. Jesus used the Word to resist temptation to sin. Above all, pray ceaselessly, something I ceaselessly need to do more of!